Find the answers to your questions below, or alternatively, please get in touch if you have any other questions. Where do I find the dates for upcoming camps and gradings? To find dates for any Infinity events or upcoming competitions please check out our events calendar. There will also be posters around the gym and emails sent out closer to the date of the event. These emails also include a payment link if necessary to pay online. What are the belt rankings? 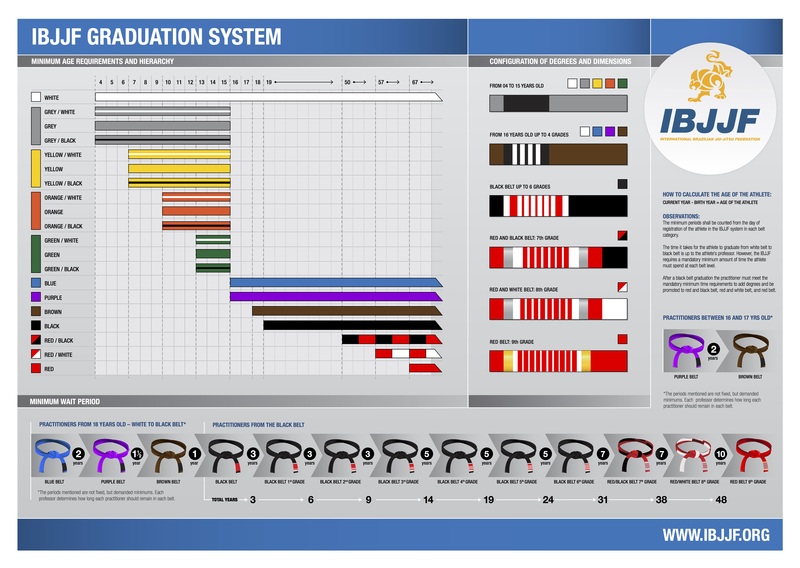 Below is the IBJJF’s belt graduation system that represents the belt system and the ages you can receive them. For a more detailed explanation please read the below pdf using the link. As Infinity have a number of locations, age groups and payment methods it is best to go into your local academy and chat with the instructor. This way the instructor can run through what best suits you and/or you child’s needs and answer any questions. How do I book a free class? You’re able to book a free class online through the booking form on the page. Please make sure that you check the timetable first to ensure you arrive on the correct day and time of the class you wish to attend. Alternatively, please don’t hesitate to give us a call on 0481 781 196 or email us on [email protected] and we can get you all booked in. How do I contact Infinity Martial Arts?